All of the ArCHdes winners represent a positive and substantial VALUE to the project Owners. In other words: the design of each Architect added Value to the project that would otherwise not exist. One of the reasons for Architects to exist and to continue designing homes for their clients. No other entity provides this level of quality and value: an Architect. This Architect, displays in all projects done by the firm, meticulous attention to detail, inside and out. In the interiors, careful attention is made with the use of trim and materials, to boldly define spaces and impart elegance to the project(s). This is a seasoned design veteran, highly knowledgeable in the use of space, form, mass and materials. Jury Comments: wonderfully detailed Arts & Crafts cottage with sensitively scaled features, including shed-roof dormers. Nice transoms. Well detailed interior. Nothing left to chance in these Architect’s designs. Everything is designed and detailed to work properly and be part of the overall composition. Jury Comments: unexpected two-story glass wall with returns for a palatial grand piano playing experience, along with excellent views from other furniture arrangements. Jury Comment: This project exhibits a nostalgic trip to yesteryear, with an experience eye to contemporary massing and detail. 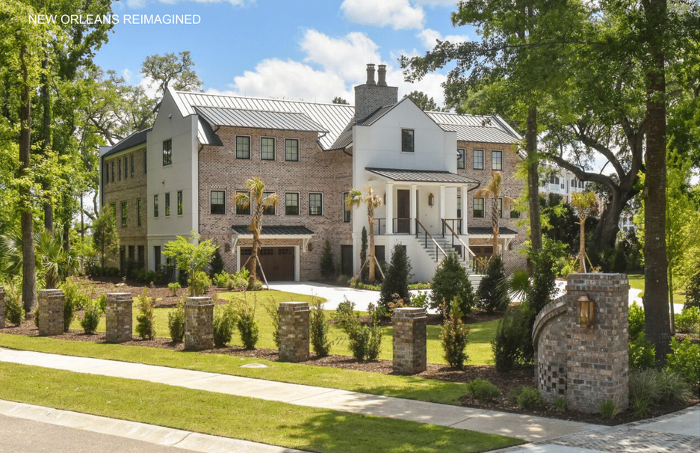 Jury Comment: This project is an amazing transformation: from a plain existing tract house to an expressive gable manor house the envy of all other homes in the community. The Architect’s capability to add a 2nd floor over existing space illustrates a master at work with his craft. This Architect adds values to the homes he renovates for his clients. Jury Comment: On many of this Architect’s projects, he continues to display an extraordinary ability to weave an unexpected swimming pool into the structure of his new additions. He also displays, in every project, his trademark use of special large operable glass door areas, wherein the inside moves out and the outside moves in, psychologically doubling the perceived space in the home. This gives his clients an unequaled sense of luxury and spaciousness. 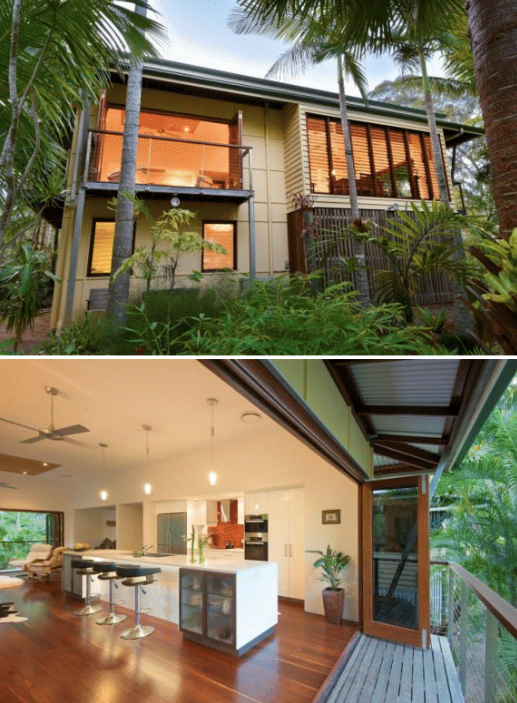 This Architect adds a huge value to the homes he renovates and expands. 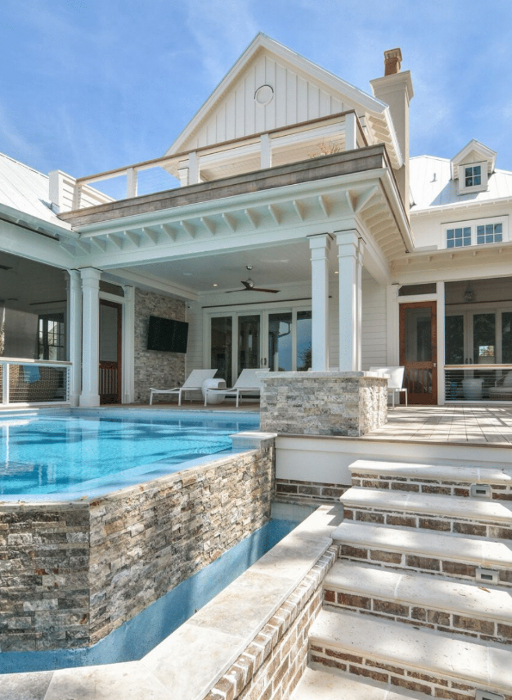 Jury Comment: as indicated in the overall comments for this Architect, here is one of his classic pool additions being woven into the fabric of the house and additions. The result is a homeowner’s experience of opulence and views where none existed before. Jury Comments: this Architect has the ability, in project after project to create new kitchen spaces in both renovated and new additions that expand the feeling of spaciousness and functionality, merging the public spaces in his residential projects. Jury Comments: This Architect has the ability to raise even plain existing houses into the realm of architectural splendor with contemporary detailing as exhibited on this project, wherein his trademark folding exterior glass doors merge the interior with the exterior, turning the home’s spaces into a grand experience. 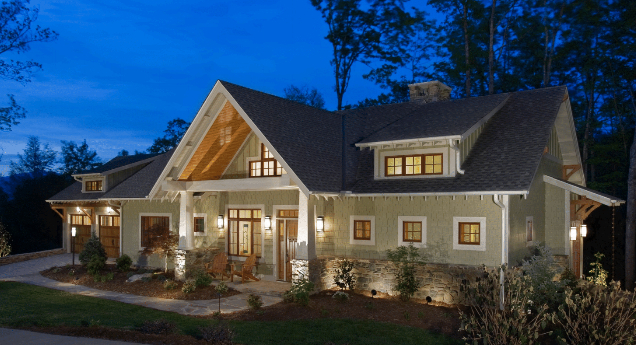 This Architect delivers a tremendous added value to the homes he designs and renovates. Jury Comment: Outstanding value design on a budget, that feels like an estate project costing 3x the price of this house. This Architect knows how to provide a huge value to his clients, providing an upper-end design for a budget construction cost. 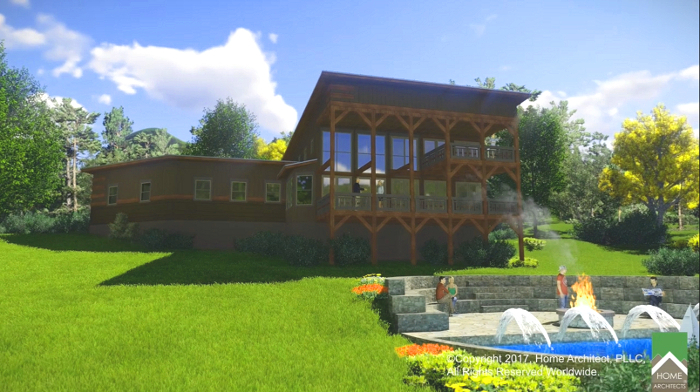 Jury Commenst: Spectacular lakeside estate mansion project with excellent views of the lake and successful incorporation of massive features such as a large swimming pool area, decks, porches, barn, master planning for future facilities and large motor court turnaround and parking. Gorgeous design that fits the site in a grand manner. Nicely executed post and beam details. Jury Comments: Incredible transformation of a plain, older country house into a contemporary mountain mansion. Skillfully designed new addition and renovation features allow for wheelchair access throughout, and a new elevator, interior spacial connections, totally gutted and new walkout basement, helicopter landing pad, exterior ramps, extensive site works including a new palatial entry gate complex and building system upgrades throughout, along with successful mold mitigation. 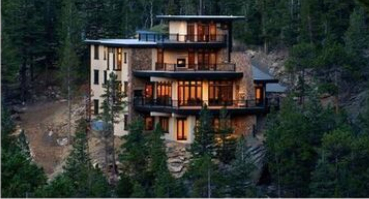 Jury Comments: Project adroitly designed a large mountain style home overlooking a grand water/mountain view from on high. New swimming pool with hot tub waterfall, 3 car garage/shop, extensive 2nd floor loft with guest bedrooms, palatial master suite on main level, large rear porches overlooking main view and pool, from motor court/parking area with boulder fountain, Architect designed over a mile of new roadways and security entrance gate areas with mountain style detailed gates and other features. 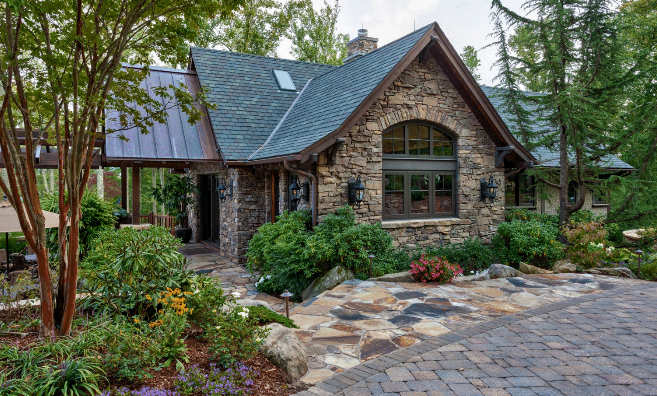 This apparently humble country cabin from the street transforms into a luxury multi-floor estate house at the rear, with a walkout basement level, and large glass areas and porches providing views of the owner’s farm acreage beyond. 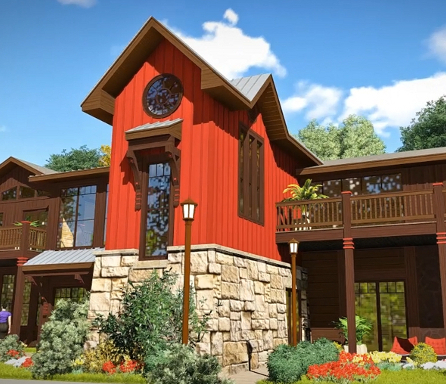 An enclosed “bridge” connects the main house to the garage, providing a home office and laundry/pantry directly next to the kitchen in the main house. 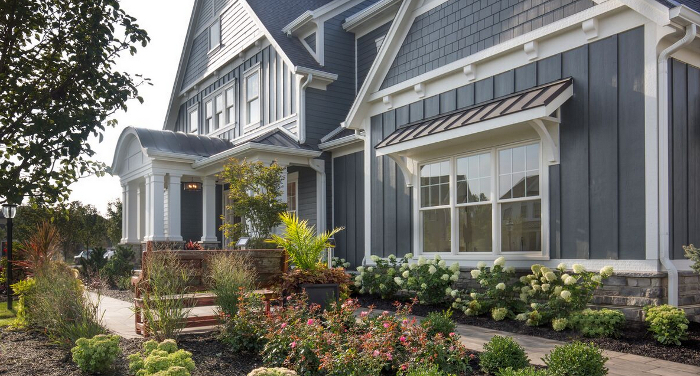 A county cottage gable-roofed front porch greets visitors. The garage is angled to break up the apparent mass of the house from the front. Copper roofing accents roof pop-outs. All glass is carefully shaded from the summer sun. All in all, a remarkable design for a country house with appeal. Jury Comments: This Architect knocks it out of the park again. His firm carefully plans the movement of the entry sequence into his projects, along with unexpected and dazzling features like exterior gas-fueled fire pits and carefully scaled features, like the entry slabs and gravel, to yield a feeling of elegance using ordinary materials. This Architect creates internal views with large glass areas, plantings, courtyards, exterior living areas and other features when there are no naturally occurring views. This firm adds considerable value to their projects. Jury Comments: spectacular waterfront home. Architect takes advantage by designing 2-story glass walls facing the water. Logical and beautiful. Who wouldn’t want to live here? Incredible. Classic contemporary residential architectural in a grand manner. But once again: this Architect accomplishes all this splendor with humble materials, like painted drywall. Minimalist railing details help keep views transparent across deck.Architect adds value to their projects by virtue of their designs enhancing and framing the natural features. Functional furniture and cabinetry placement insures flow-through views to the exterior from even deeper within the interior. Jury Comments: consistently across this Architect’s projects, there is first, an obvious intention to fit in with the surrounding neighborhood, however, the attention to detail is remarkable and sets this Architect’s projects on a higher level, transcending mere home building and elevating his projects into the realm of architecture. His interiors are outstanding, and unrelenting in detail and his use of plentiful rear windows provides an pleasant surprise to both owners and visitors to his homes. Jury Comments: as indicated in the overall comments: this Architect’s attention to detail elevates this home from a mere house into architecture and with good functional purpose: such as shed roof features shading and framing glass below, giving it a sense of place while performing a valuable service. This architect provide added value to his projects. Jury Comments: as stated in the overview comments for this Architect, plentiful glass areas in the rear of his homes provide natural light and views. 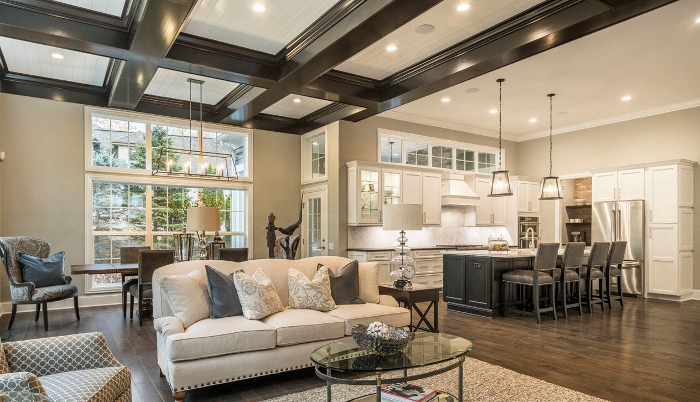 Also, features like coffered ceilings define interior spaces while providing a feeling of elegance, several notches above most neighborhood houses, while providing a sense of place for built in lighting, which has been carefully planned on the ceilings. 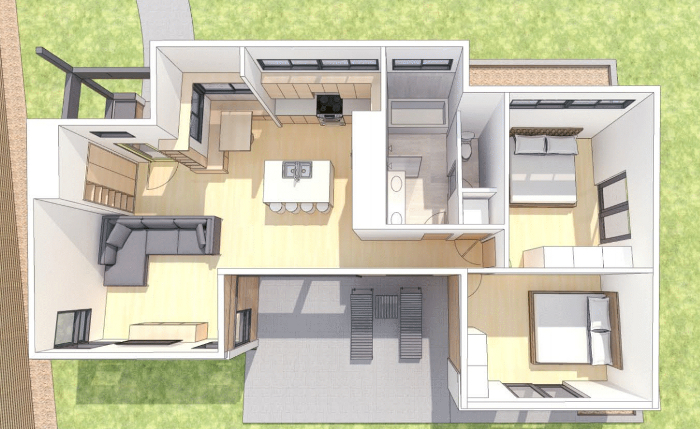 Floor plans with open space planning (as seen here with living and kitchen spaces merging) make his project feel larger. Other windows over the rear cabinets are a creative touch, making that wall appear more transparent and helping the kitchen to seem more open. Jury Comments: while appearing to be an initial concept design, this has an interesting barn-like industrial feel to it: a single main shape housing all interior spaces, which surely will help control costs and contribute to a feeling of interior spaciousness. 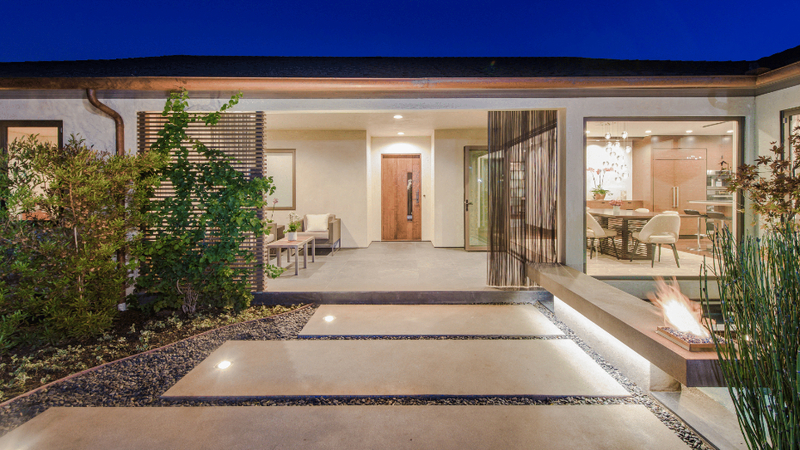 Then, the 2-1/2 story glass wall opens to an exterior stone-paved patio. Architect is adding value to their designs with simple approaches like this. Jury Comments: Spectacular high-profile Cubist European Modernist flat-roofed California approach. Delightful 3D corner pop-outs provide tremendous interest to this project. This treatment continues at other corners and on lower elements, exploding various areas on the surface of the main box. Very architectural and contemporary. Gorgeous spiral stair in one exterior space leading up to roof and obvious use of roof for exterior living. Artistically, this is on the level of Mondrian, in three dimensions. Jury Comments: interesting and compact concept design. Clear definition of entry-public side and rear private/view side. Simple but thoughtful arrangement of spaces. Jury Comments: Spectacular multi-story vertical house in a hillside. Careful attention to the various stairways and integration with the topography of the site. Interesting change of materials on various wall planes at different levels. Nice lower slope shed roof profiles. Striking modern design with interior spaces exploding with large glass areas to showcase hillside views. Jury Comments:This Architect has an amazing depth of design capability. 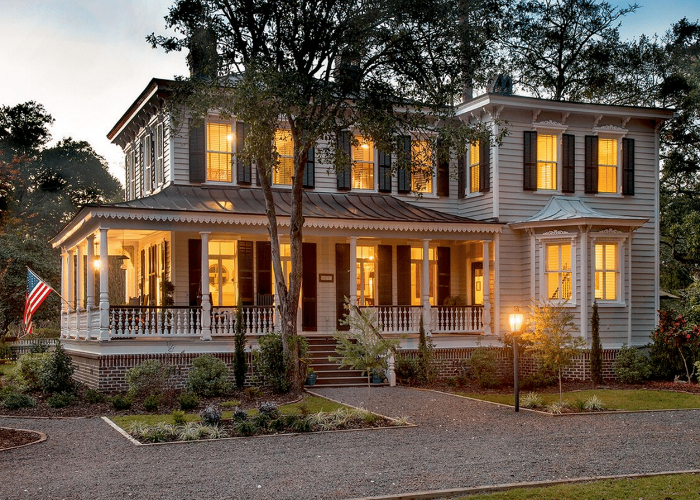 The firm’s work displays the solid ability to handle historic renovations along with contemporary projects and everything in between. We believe this Architect can handle any type of residential project successfully. Jury Comments: This project has an inviting and comfortable-looking entrance stair sequence, leading up and into a classic modern stucco box on 3 levels. 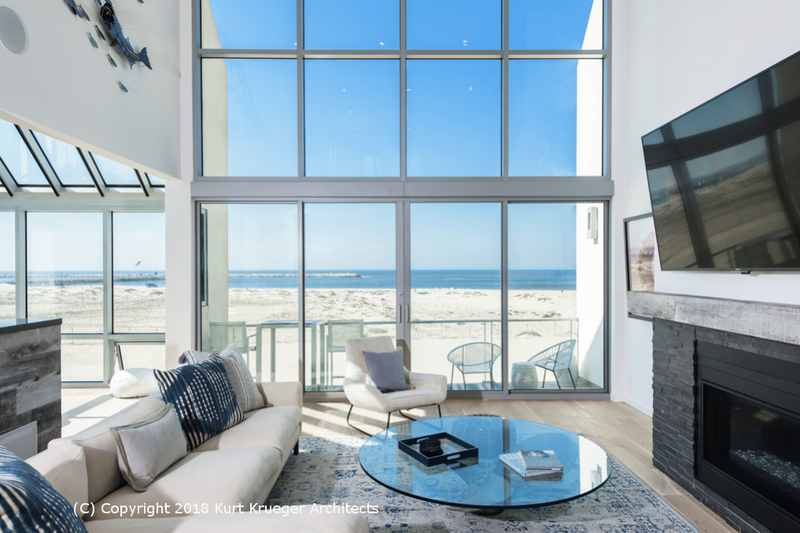 Simple design maximizes exterior views with sliding glass doors, including toward the water to the rear. Roof top is utilized with the flat rood and perimeter railings. Appealing lighting inside and out. Simple details yield good value added by Architect. 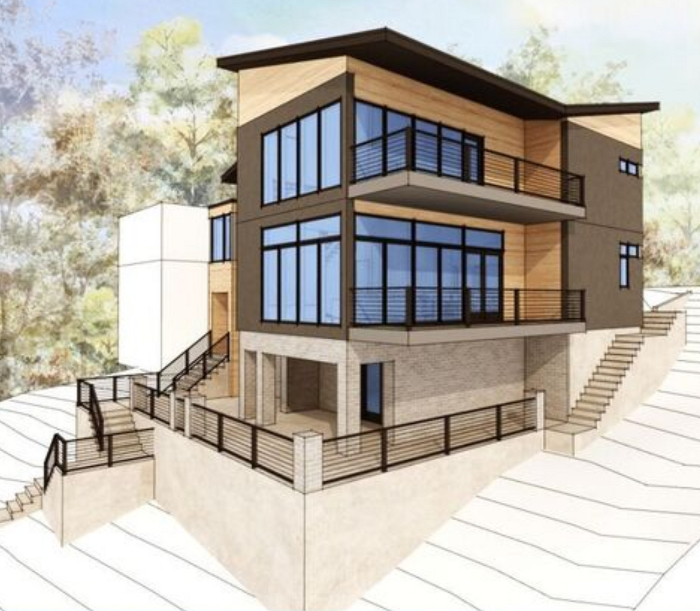 Jury Comments: this Architect’s versatility is evidenced by the fact that they can not only design 3-story contemporary projects on Big Water, they also can design sensitive historic renovations like this project. 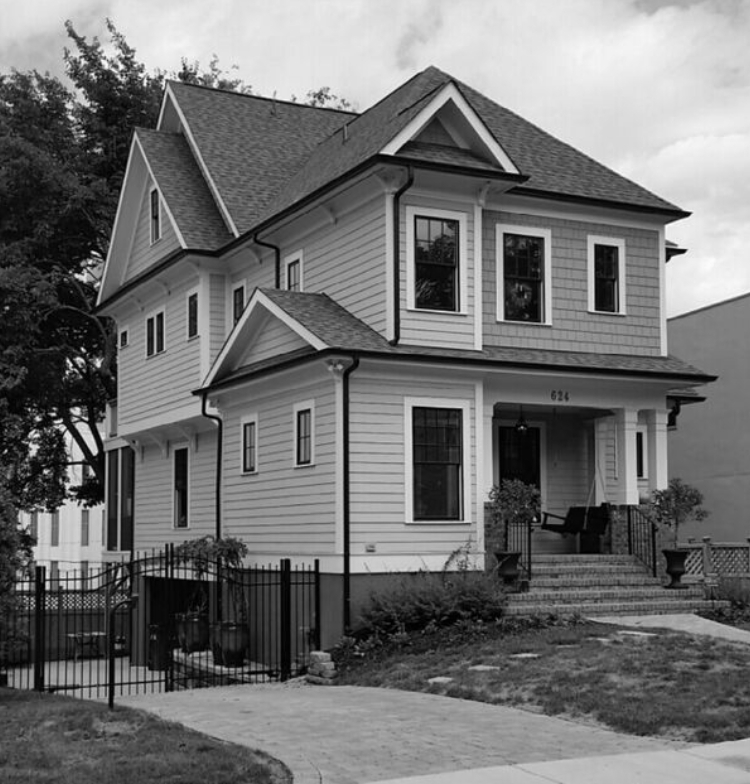 The careful and measured use of historic railing pickets, scalloped porch fascia and decorative rafter tails at the top level provide a sense of history that appears like this house has looked this way for a hundred years. 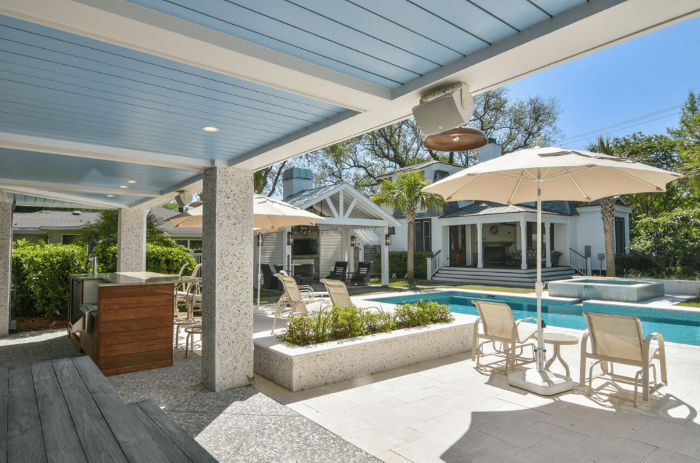 Exciting features in this design, such as the swimming pool designed as part of the exterior spaces close to the home. Mastery of rich details such as infinity edge, stone, copings, posts, rafter tails, fascias. Interior spaces impeccably designed by this Architect. Attention to detail everywhere. This creative project includes both modern and historic features and materials. 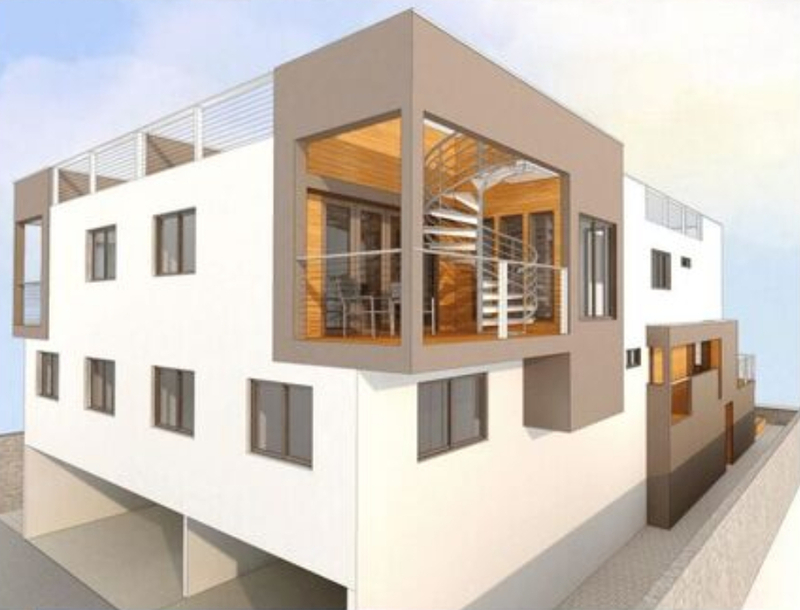 Architect successfully solves the main living floor being on the 2nd level to to Floor Plain requirements, with a front stair and landing arrangement. Expressive metal roof elements. Incredible water park at rear pool for children. Jury Comments: Creative expansion of exterior living areas to bring the inside out. Successful project working with the constraints of existing structural elements. 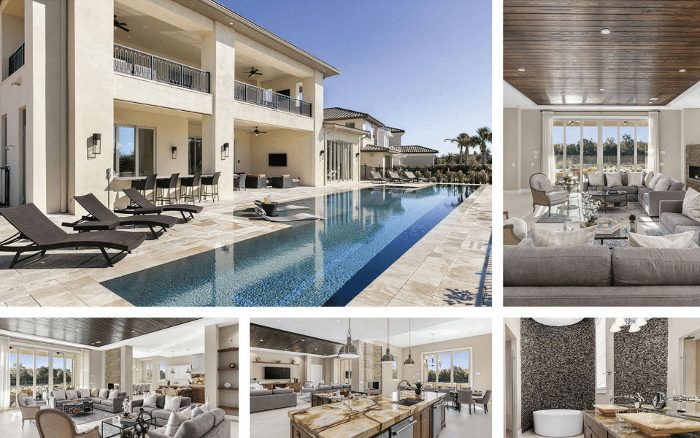 Jury Comments: Once again, this Architect displays his ability to design large Florida mansions with swimming pools and outstanding interiors. In this projects, the approach sequence is carefully handled, in the transitional walkway up to the home front door. The interior provides high-profile features such as the rounded bath element, large open kitchen and substantial glass areas open to the outdoor pool area and view. 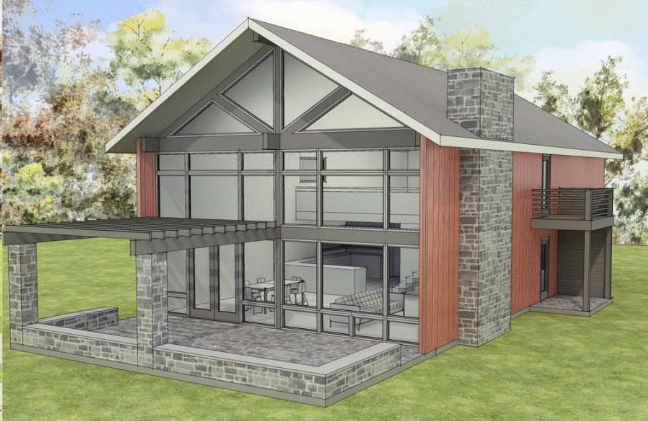 Exterior is restrained and simple, providing value to the Owner. 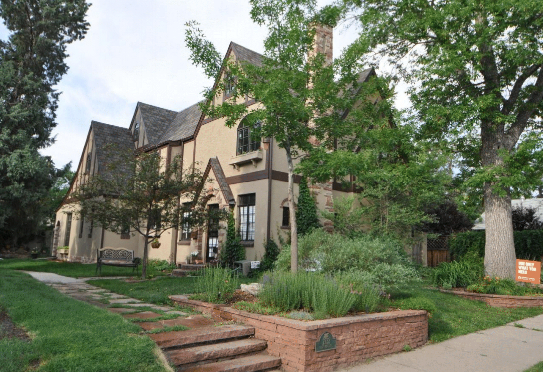 Jury Comments: This Architect periodically submits a historic type of project, often due to urban Denver requirements regarding historic areas in the city. Once again, the Architect has successfully solved this design requirement and provided a handsome house on a limited site, that looks likes its been there for a very long time, but that happens to have been well-cared for over time. Nice exterior remote entry steps and retaining wall planter. What makes this house so remarkable is the smaller photo of it during the winter. You ca really begin to understand how this creative long design merges well with the mega land topography. 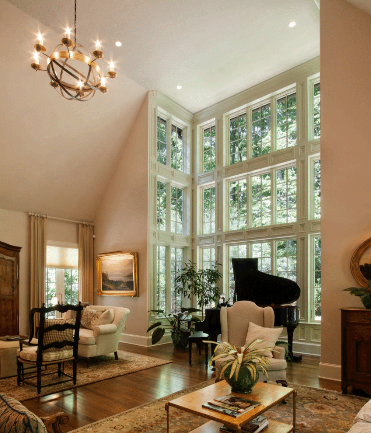 Lots of glass and architectural features provide views to the breathtaking scenery. 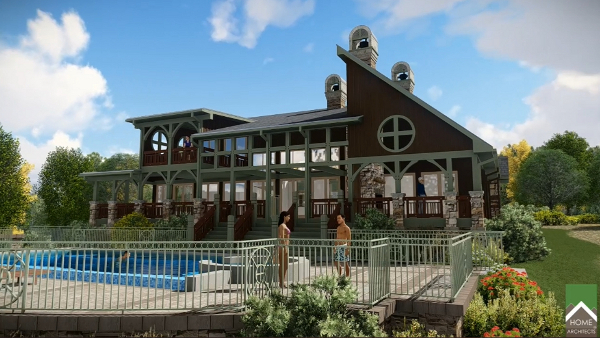 Jury Comments: spectacular multi-level mansion on mountainside. Remarkable features, like a 45’+/- tall central atrium with natural light and views due the large glass areas, responding appropriately to the incredible views. Architect obviously is capable, detailing project for a variety of conditions stair-stepping the massing down the mountain slope to foundation walls and stonework. Congratulations Rod Kazenske, ArCH: rebranding his former Colorado Custom Builders to Yardstick Studio Architecture. Rod says he’s enjoying the pure architecture. January 2018 appears to have an increase in construction and design work for Architects in a variety of categories, both commercial & residential. ArCH hopes that all of our members are enjoying renewed work & income on good, solid projects. Some firms report continuing work, some report reduced hourly rates, while others report increased rates. The CRAfts™ program is directly linked to the ArCHdes™ design awards program, as the current fast-track to obtaining the CRAfts™ designation is by winning 10 ArCHdes™ design awards. Since a firm may submit up to 5 entries in the ArCHdes™ per year, this means that it may be possible to qualify for the CRAfts™ designation within 2 years, assuming all 5 project are award winners. As I recall, I do believe this job is Not what you might call a normal architectural position. I believe it is a diagnostic and technical problem solving position in the Atlanta area, where you would visit high-rises and other buildings (including sitting in a bosun’s chair and going up and down the exterior face of those buildings) to understand building envelope failures and create solutions for solving those problems. So if you have no fear of heights, enjoy getting into the nitty gritty of how to keep water out of structures, and aren’t passionate about designing high profile designery projects, this could be some steady & dependable employment. Motivation is an important part of any Architect’s psyche. We all have daunting tasks before us, especially after we get the job (obtain a new project). When the euphoria of business success wanes, we then are faced with the task of actually programming, designing, developing and detailing the project. —-by the Chinese philosopher Lao (c 604 bc – c 531 bc) in the Tao Te Ching, Chap. 64. Which of course means: that even the longest and most difficult of tasks has a simple and humble starting point. For Architects, that may be turning on your computer, booting up your CAD or 3D software and setting up the the computerized files and blanks sheets for the project, then making an appointment with the Client to take Programming notes and see their land. Then, one things leads to another. When we, as Architects, find ourselves in Construction Drawings and are faced with creating all the detail necessary to properly explain and specify the project to Contractors, my technique has always been to at least do one thing; anything, that advances the project forward, before leaving my chair. Draw one line. Install one dimension, copy one detail. Edit a paragraph of specifications. Anything that gets the project further along than when you sat down to work on it. You will find that your natural ability and curiosity will take that one thing and it will lead you to other details, specifications and dimensions. You will end up doing much more than the single thing you were thinking of. And when you finally leave your work station, you will have accomplished more than you anticipated. And then you will have moments of sheer inspiration that bless your work, during which hours can pass and you are so engrossed with designing or developing the work that you will see the sun going down and think: “Hey, I just sat down this morning, how did it get to be so late?” Your motivation will be supplied by your own internal abilities, once you get started. The main point is: BEGIN. Each day. That’s what our Oriental fried was encouraging us to do more than 2,500 years ago. And your experience, creativity and work ethic will take over and help you advance the project. 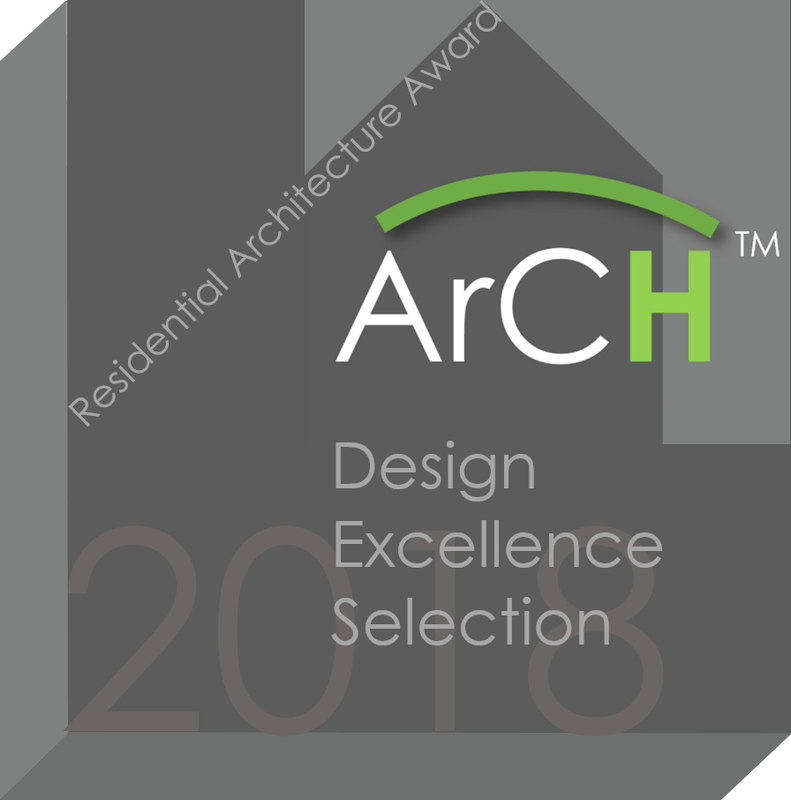 When you are a member of ArCH, you are able to access experienced peers, who are also Licensed Architects. About what? 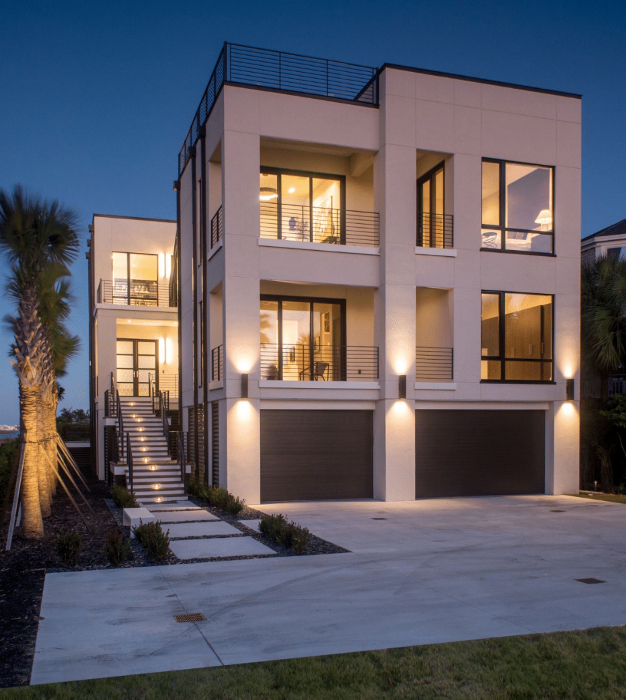 Just about anything you can imagine as an important issue involving the business, marketing, design or documentation of residential architecture. For instance: this last week, there was a lively series of email discussions about the best software for architectural invoicing and time-keeping. James Spencer, ArCH, Arlington, VA and Amy Patterson, ArCH, Arden, NC exchanged valuable experience with other members: Bennett Sabatier, ArCH, Lafayette, LA, Rod Kazenske, ArCH, Denver, CO. Members reviewed various benefits of QuickBooks, BillQuick, QBProContractor, ArCH’s own ArCHbill (under development), Preasto and others. This benefit alone, makes the low yearly membership fee of ArCH (currently $159/year) an amazing bargain. Where else can you receive such pointed counsel, strictly focused on residential architecture? Join ArCH here. Enjoy peer counsel. Important advice here: backup all the work you do during a day, at the end of that day (at the very least). And require that any staff you may have do the same. Why: because the amount of work you can lose when you are working on AutoCad or Revit or SoftPlan or ArchiCad can be enormous. If you have ever had a file become corrupt or a hard drive go bad while you’re working on a project (haven’t we all?) you’ll understand the subject of this online article. The sinking feeling is devastating: the sense of loss is immeasurable. 1. Your main hard drive, of course. Save your file by naming/numbering it slightly differently every 10 minutes to 30 minutes. For instance, you may call your project: 7-17-2016-Smith-156 (for the date, the project name and the iteration of the file. The SaveAs name in about 15 minutes might be: 7-17-2016-Smith-157. And the next day: 7-18-2016-Smith-158. In this manner, you are constantly replacing the current file with a new file. So: if your current file becomes corrupt, you will have the file immediately preceding it to use. 2. A flash drive. You can obtain “thumb drives” or “flash drives” that fit easily in your pocket that can hold 256GB and more, for not much cash, and you can take this with you whenever you leave your office, home or other location. In other words: if your house or office burn down or other disaster occurs, you will have that little flash drive in your pocket with your last 10 year’s worth of projects. What a relief you will feel to have that! 3. External hard drive. This is a hard drive that is external to your main computer, about the size of a thick paperback novel. It can hold as much as your main computer hard drive, perhaps more, depending on how large an external drive you purchase. Therefore: you should have, at a minimum: your latest files in at least 3 different locations. If the file you are working on right now goes bad, you have all of those others to fall back on. The worst case should be you would lose the work you’ve been developing during the present day, if your file goes bad during any given day. This scenario would happen if your computer’s main hard drive went bad during any normal work day, before you have backed up for the evening. If you want to become even more obsessive, you can perform your end of day backup at noon as well. If you adhere to the above, and have your staff do the same, your catastrophic losses due to crashed hard drives should be minimized. This policy has been in effect with the Home Architects for the last decade, and the most lost has been a single day’s work in that time. Now then, if you want to get really concerned and have the financial capability, you might want to also consider obtaining a backup server and/or backup computer for your main computer(s) that you and your critical staff use. Treat the secondary machines like additional drives on your main machine. In that way, if your main computer(s) crash, you should hopefully have the backup computer(s) still functional. One last thing: if you don’t use a sine-wave UPS (Uninterruptible Power System) device for your main computer(s), you are playing with fire. A quality UPS for each important computer in your office will save you not only lost time rebooting when there are power failures, you just might save your computers themselves from frying in the event of severe storms in your vicinity. However, if you enjoy replacing damaged computers frequently, you may ignore this advice.